Super Savings Item! 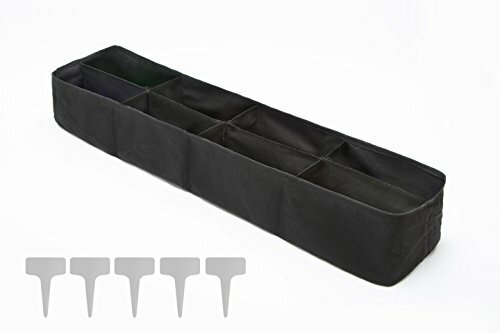 Save 38% on the Kenley Fabric Raised Garden Bed - 135-Gallon Smart Planting Container Grow Bag Planter Pot for Plants, Flowers & Vegetables - with Plant Tags Set by Kenley at Tulips Orchids. MPN: 4336473312. Hurry! Limited time offer. Offer valid only while supplies last. Plant a garden anywhereThe Kenley fabric garden bed lets you grow flowers, herbs or veggies such as cucumbers, tomatoes or squash in any sunny spot. The Kenley fabric garden bed lets you grow flowers, herbs or veggies such as cucumbers, tomatoes or squash in any sunny spot. Choose a corner of your deck, a rocky area in your yard or a piece of land that's been paved over, and in minutes you can have a raised bed ready to plant. The Kenley garden bed is made from a tough, non-toxic fabric commonly used by surgeons. Unlike some plant pots, it does not leach harmful chemicals, and helps keep critters and bugs at bay. The fabric allows for the drainage of excess water and aerates the soil, helping your plants grow. Starting your own garden is easy with the Kenley fabric garden bed. Simply unfold the bed, place it where you want it, and fill with 6-8 bags of fresh soil. The rectangular bed has eight compartments, each compartment will house 17 gallons of soil (135 gallons total). It's easy to separate different types of plants, or crops planted at different times. Make sure you follow the spacing instructions on your seed packets or transplant containers, but to give you a rough idea about the size, you can plant about 1 tomato or 6 basil plants in each compartment. We recommend to use a mix of garden soil, not potting soil and fill the bed fully so that the sides don't cave in. When the season is over, the bed can be emptied, stored and reused. It is machine washable at low temperatures with minimum agitation and a low spin. Do not tumble dry, let the bag to dry completely and fold for storage. Although most plants will be naturally air pruned by the fabric, plants with aggressive root systems may root through the fabric. CREATE A GARDEN ANYWHERE: Too many rocks? Poor soil? Paved yard? The Kenley fabric garden bed lets you garden wherever you like. Simply place the bed where you need it and fill with fresh new earth. Plant your veggies, salad leaves or flowers and you'll soon have a beautiful garden. CHOOSE YOUR GARDEN SIZE: Want to grow your own produce, but don't have much time? Or maybe you've got kids who want to try their hand? By placing multiple Kenley garden planters in your yard, you can create a garden of any size, from a few tomato plants to an urban farmstead. This rectangular bed has eight 17-gallon compartments (130 gallons total). PUT YOUR GARDEN AWAY WHEN IT'S DONE: No need to have empty garden pots and containers cluttering up your yard in winter. When the growing season is over, simply empty the earth out of the fabric bag and pack it away. Kenley fabric garden beds pack down for storage and can be reused year after year. MAKE GARDENING EASIER: Kenley fabric garden beds are effectively raised beds, with plants roots growing above the natural ground level. This makes tending your garden much easier as you can weed, prune, water and harvest your crop with less stooping and bending. It's ideal for anyone with back or joint problems.